You are here: Home / Events / Another Successful Clays for Courts – Thank You! Another Successful Clays for Courts – Thank You! 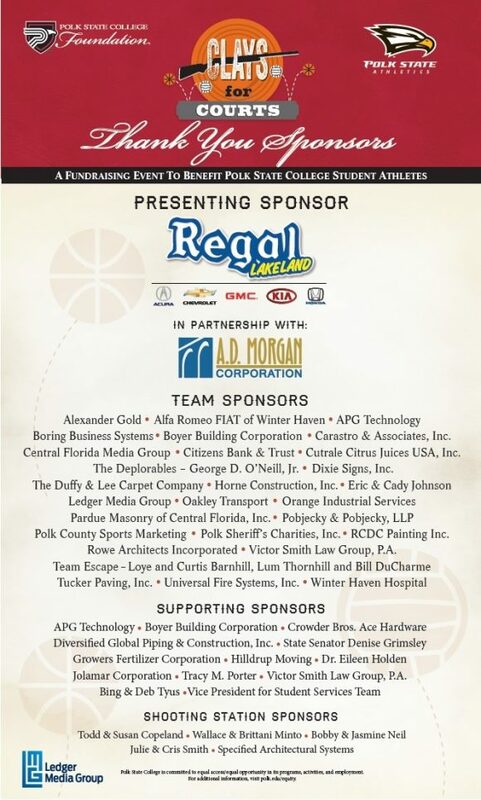 On April 21, the Polk State College Foundation returned once again to Tenoroc Shooting Center for the Regal Lakeland Clays for Courts in partnership with The A.D. Morgan Corporation. This sporting clays event benefits the basketball and volleyball teams. Over 120 novice and sporting clays enthusiasts shot in the 50-clays event. Athletes from basketball, volleyball, softball, and soccer assisted with the event.